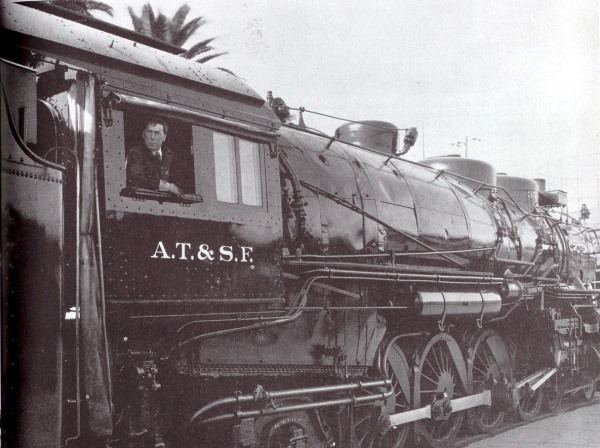 A real Western hero of the silent film days, William S. Hart, poses at the throttle of the first eastbound "Chief" of the Santa Fe as it prepares to leave Los Angeles on November 14, 1926. The engine is No. 3748 of the Mountain type built by Baldwin in 1924. The two sandboxes, typical of Santa Fe practice, are quite prominent as is the number box in back of the stack, a feature unique with this road. These were placed on both sides of the engine. The "Chief" was scheduled to make the run from Los Angeles to Chicago in 63 hours, cutting five hours off the former schedule. Weight, total engine, 361,600 lb.